Sorry, but the translation of German version of this web page still was NOT started yet - thus please read it either in English (from this web page), or in Polish (from the Polish web page), or visit this page again after a few months. Niestety, tłumaczenie niemieckiej wersji tej strony NIE zostało jeszcze zaczęte - proponuję więc albo czytać ją po polsku (z polskojęzycznej strony), lub po angielsku (z tej strony), albo też zaglądnąć tu ponownie za kilka miesięcy. Notice that until 17th of May 2016, at the address www.pajak.org.nz - which now runs this web page, there was available a different web page named pajak_for_mp_2014.htm. It reported my experience gathered during standing as an "Independent" candidate for the New Zealand parliamentary election of 2014. Both language versions of that my 2014 election reporting web page (i.e. English and Polish) are still available, only now they are shifted to the background - you can view them by clicking on this (green) link. In the year 2015 were also developed two further equivalents of that web page relating to the NZ parliamentary elections of 2017 - see web pages pajak_re_2017.htm and pajak_for_mp_2017.htm. However, in August 2016 my attention was directed at verses in the Bible, which forbid believers in God to assume an active role in any governing - these verses, and also my reaction to getting them know, are described in the "Introduction" and in "part #J" from my web page named pajak_for_mp_2017.htm. I sincerely invite the reader to watch at least one out of a whole series of videos available for free on the Internet and objectively reporting on my life's scientific achievements. The most important among these videos, which I especially recommend to view, is around 35-minute long free film on YouTube, entitled "Dr Jan Pajak portfolio". It is available in English, in Polish (po polsku) and also in German (auf Deutsch). If you use the browser "Google Chrome", then in case of problems with the above green links, the same film (and also the working links for it) is displayed by the web page pajak.org.nz/dju.htm, or web page totalizm.com.pl/dju.htm. Detailed description of this film is provided in item #B1 from this web page. 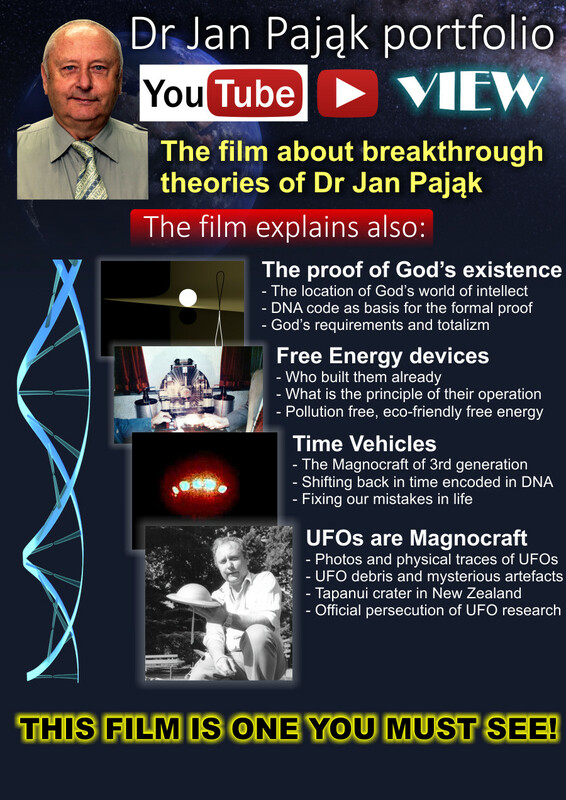 In addition to the film "Dr Jan Pająk portfolio", YouTube also has several other videos which I co-authorize and which I affirm as objectively presenting my scientific accomplishments, and hence the viewing of which I recommend here as well. Their descriptions and links are provided in items #A4 and #A5 of this web page (out of these, I would especially recommend watching a 4-minute long video entitled "How Big is the Magnokraft"). Unfortunately, independently from these positive videos, the Internet is also overflowing with negative products of various individuals, whom the Bible calls "goats" or "chaff" for reasons that I explained at the beginning of "part #A" from the web page named dipolar_gravity.htm. These "goats" or "chaff" try to pop out of their skins to disgust, sabotage, block, or even just ridicule every my scientific achievement. If anyone is curious as to how the products of their "minds" look like, then he/she can look at some their "fruits" with the help of (green) links that I quote in items from #B2 to #B2.3 of the web page named faq_pl.htm. The film "Dr Jan Pająk portfolio" was produced by my friend to commemorate the occasion of my 70th birthday. It summarizes, reports, animates and illustrates most important scientific achievements of my life, namely my discoveries, inventions, theories, formal scientific proofs (including the formal scientific proof for the existence of God), subsequent professorships in 4 different universities of the world, etc. So together with descriptions from this web page, the film has the potential to positively influence the life of the viewer. Furthermore, since it informs about the existence of technical devices already proven in work, but ignored by official science and by decision makers, which (devices) have the potential to solve most dangerous problems of our present civilisation, the film may inspire someone to build these devices for the good of his/her own nation and the entire humanity. This web page was prepared mainly to provide links, internet addresses, and more detailed descriptions of this excellently-designed and produced HD and HQ film. Furthermore, it records for future generations the descriptions of every-day problems and realities faced by inventors and discoverers who altruistically try to introduce true progress to our civilisation. www.youtube.com/watch?v=RX-FwUXOs98 (the German version - auf Deutsch). At the same time detailed descriptions of the content of this film are available below in the devoted to them "part #B" of this web page, while short summaries of these descriptions are also provided in item #H1 from my web page named pajak_for_mp_2017.htm, item #J9 from the web page named totalizm.htm, item #K7 from the web page named prophecies.htm, and item #L5 from my autobiographical web page named pajak_jan_uk.htm. From this autobiographical web page pajak_jan_uk.htm readers can also learn descriptively further details about the course of my life and about my research, which are to extend and complement the information presented visually in film discussed here. Of course, the running and watching this excellent film does NOT require to remember nor to copy the above links, but just suffices that to the separate searching window which shows up in the top part of each youtube.com web page, or search engine google.com, one enters the title of this film, used as searching keywords - i.e. one enters the title "Dr Jan Pajak portfolio" (but typed without quotes). Developed already is a two-side leaflet of A4 format, which encourages to see the film discussed here. 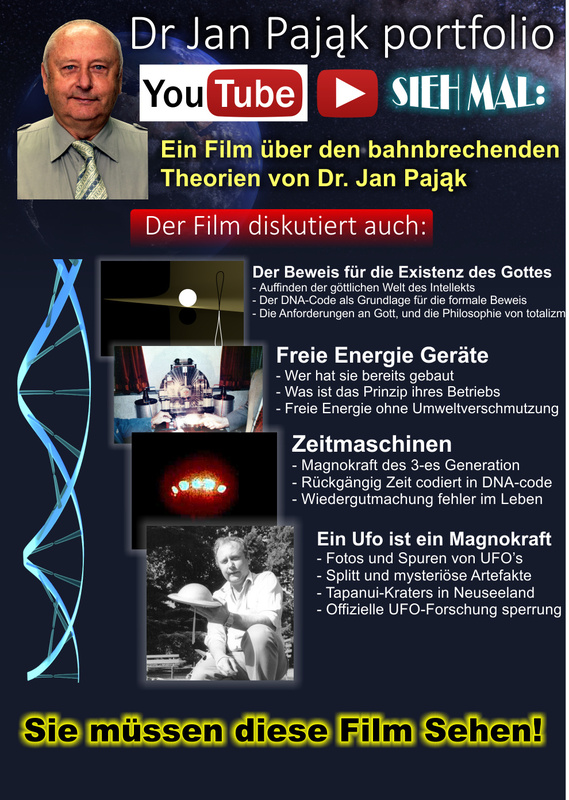 This leaflet is available in all three languages, in which is also available the film "Dr Jan Pajak portfolio". Below in "Fig. #A1" is shown the English version of this leaflet. In turn the Polish and the German language versions of this leaflet, the reader is able to see, or to download to his/her own computer, from "Fig. #B1" and "Fig. #B2" in "part #B" of this web page, or from repetitions of these figures provided under items #H2 and #H3 of my web page named pajak_for_mp_2017.htm. All these three leaflets are also displayed in the similar areas of the Polish and German versions of this web page. As a scientists who researches topics that may save our civilisation from the incoming self-inflicted destruction, I have special obligations toward New Zealand. After all, I live in New Zealand. Also New Zealand is specially prone to problems for which my inventions and discoveries provide effective solutions. For example, I worked out the design and operation of the Zhang Heng Seismograph, which telepathically senses impending earthquakes and long in advance provides remotely warnings of the incoming disaster. Thus, such a device would be very handy in New Zealand so frequently troubled by earthquakes - for examples see my web page quake.htm. All what is needed to have this extraordinary device, is just someone with the "golden hand" skills (in which skills New Zealanders supposedly are good), who with the assistance of my scientific knowledge and advice would make it again almost 2000 years after it was first build in China. My friend from Germany (the same who printed for me the gift of 9999 elections flyers for 2014 parliamentary elections), volunteered to print for me free paper copies of the leaflet shown above in item #A2. Unfortunately, when in 2014 the same friend posted to me the free gift of 9999 election flyers, I had a lot of problems with NZ custom officers who wanted that I hire a custom agent, and that I pay the import duty for this free gift - for details see (2014/6/19) in item #N3 and (2014/5/28) in item #M2 of my election-reporting web page named pajak_for_mp_2014.htm. So I asked my friend to wait with the printing until I check with the custom office for what number of printed leaflets I could avoid having similar problems with the above leaflet. On Thursday, 19th of May 2016, around 12:20, I entered the scary to me building of New Zealand customs offices in Wellington. For me it is a very scary place to go in there, as visitors already at the entrance are warned that this is the high security area, thus presumably numerous hidden TV cameras are watching and recording every move (i.e. probably they also recorded the entire my visit, and the discussion with the custom officer). I feel in there as if somewhere behind curtains armed guards are only waiting ready to pounce at, or shoot, a wrongly behaving client. I explained to the female custom officer the situation (i.e. that I am retired scientist and have no spare money to print this leaflet myself, but my friend from Germany would print it for me for free, and post to me as a gift, so that I could distribute it also for free to people around my area of living - hoping that the leaflet reaches hands of someone who has a potential to build my inventions in New Zealand). I gave her the printouts of both sides of the above leaflet together with the address of this web page, and asked her how many such leaflets my friend could print for me and post to me as a “printed matter” free gift, without the need for me to pay the import duty. After some time spend in a different room, presumably for checking the legal side of my case, she returned and replied that “none”, because my leaflet bears attributes of an "enterprise" (although I was clear that I am retired and I do NOT own any company that could in any way benefit from the distribution of this free leaflet), so I must pay the import duty for any number of them, and also if such a shipment of leaflets arrives to New Zealand, I would also need to hire a custom agent (about which agent I know since 2014 elections, that it would cost me enough much, to make the free printing of my leaflets overseas unaffordable, while the price of printing leaflets in NZ is so high that I also cannot afford it). The custom officer did NOT provide me with any advice as to how I could appeal for making for me an exception from these harsh custom "laws" that suffocate such a way of free promoting of progress in New Zealand. So sorry New Zealanders, but probably I will NOT be able to find a way that the offer of my friend to print this leaflet for free could be accepted, as it looks that during the shipment to New Zealand the leaflet would be stopped by customs - so that it could NOT be distributed for free around my area of living and, perhaps, reach someone with appropriate skills of "golden hands" who after learning about my devices could build them for the good of people and country of New Zealand. Thus, when e.g. a next earthquake strikes (as usually without a warning - since inertial seismographs which the humanity developed so far are triggered only during the earthquake, thus are NOT able to give a warning sufficiently long time in advance for an effective escape), and some of you are to be trapped under rubbles, then perhaps you should consider ringing to NZ custom officers and convince them to make room for exceptions in import duties for free leaflets and in the requirement of hiring a paid "agent" to push "printed matter" parcels through the border bureaucracy, so that such exceptions could help future generations in situations like the one that I tried to prevent! I believe that the distributing the above leaflet for free, in order to inform NZ potential builders of my devices about the inventions shown in the film and also about fact that these inventions do exist and their proper work was already proven in practice, is morally, patriotically and legally correct thing to do. Therefore, in ways that to my imperfect human knowledge are both, legal and morally correct, I will try to continue my efforts of overcoming obstacles that are appearing in that matter. In turn outcomes of my efforts I will thoroughly report in "Part #D" of this web page - so that followers of my philosophy may gain some educational benefits from my experiences (similarly as they may gain from my reports on other difficult cases that I tried to solve accordingly to principles of the philosophy of totalizm, and that I reported on totaliztic web pages - e.g. on the web page pajak_for_mp_2014.htm). www.youtube.com/watch?v=cWM1-F5HFr0 (since 2016/9/6: 'Dr. Jan Pająk - Druga rozmowa w audycji "Przebiegunowani" cz. 2/2'). Have a lot of fun if you decide to watch these conversations-interviews. Notice that there is an interesting history linked to these interviews for the Polish Radio in London. However, because the interviews are in Polish, I am NOT presenting it on this web page. Those readers who know also the Polish language, can the history of that interview read from "part #E" of the Polish version of this web page. To celebrate my 71st birthday, my friend Dominik Myrcik has prepared another 4-minute long free video available on YouTube.com and having the bilingual (German and English) title "Wie groß ist der Magnokraft?/How big is the Magnocraft?". The video is a computer animation of the appearance, size and dimensions of all eight types of discoidal Magnocraft of my invention. Thus, in an animated (motion) manner this video compares appearances, sizes and dimensions of all eight types of discoidal Magnocraft, which through a similar computer-generation of their appearance, are illustrated, among others, on "Fig. #A2" to "Fig. #A5" (and also in further sections) of my other web page named magnocraft.htm. The video is distributed for free at the address www.youtube.com/watch?v=hkqrVePSj6c starting since 26th of April 2017. The video discussed here ("How big is the Magnocraft") does NOT contain a speaking commentary, but only images, music and sounds that simulate the whistle of air caused by the fast flights of Magnocrafts. Hence, it can easily be viewed and understood by people of virtually every nationality - no matter which language they know and use. In the "introduction" of it, is only provided a short information written in German and English, the content of which states, quote: "Our civilisation is approaching a collapse. Men turning away from each other. Everything we do is against Nature, Morals and God. A painful breakdown is arriving, but also the advent of our civilisation into a new golden era of Magnocraft. The country, which will build the first Magnocraft in the world, will be the leader of renewed civilisation. An old Polish prophecy foretells that the new leader will be an Asian Dragon - most probably South Korea. Immoral oppressors and destroyers will be thrown on their knees by dint of the mighty military power and the breathtaking greatness of the Magnocraft." Thus, the information from this introduction tries, among others, remind us what I explained in more detail in items from #H1 to #H3 of a separate web page named prophecies.htm, and what I hinted in the caption under "Fig. #A2(K3-K4)" from the web page named magnocraft.htm while documented on two entire web pages named military_magnocraft.htm and wtc.htm. On my web page named ufo_proof.htm a formal scientific proof is presented, which documents that "UFOs are already built and operational Magnocraft". Thanks to this proof, people whose minds are able to accept the truth about UFOs (so stubbornly negated by present official science), the video discussed here NOT only allows to recognize which type of discoidal UFO someone has sighted or photographed, but also to determine the precise dimensions and size of that UFO. Video #A1: Here is the starter for the video discussed here entitled "How big is the Magnocraft". Note, that independently from the above item #A5 of this web page, a comprehensive description of this video is also provided in caption under "Video #A0" from top part of the web page named magnocraft.htm. In order to NOT "torment" the viewers with unnecessary information, the film "Dr Jan Pajak portfolio" limits itself to the visual presentation in the shortest possible way the most important "ideas" that represent the most vital scientific achievements of my entire life. In turn the precise descriptions of these ideas are provided on my numerous web pages and scientific monographs. So in order to indicate to people viewing this film, where precisely they will find more detailed descriptions of the ideas from the film, I prepared this item. This item provides the (green) links to my web pages, by just clicking the mouse on which (links) the reader will be immediately transferred to the appropriate web pages where in items indicated here he/she will find the descriptions in which he/she is interested. In a series of sub-items which I am providing below, I am to describe the main "ideas" that make up the film discussed here, i.e. I am to describe my scientific discoveries, theories, inventions, formal proofs, etc. - which are illustrated and discussed in the film. For each of these ideas, I will cite here only the links to web pages and to my monographs, where the given idea is more accurately described. Many among ideas shown on the discussed film introduce the potential to solve almost all the problems crippling the human civilization of today. That is why already in the next items #B2 and #B3 I am to explain for my inventions and for other important among my ideas, these their aspects which in their descriptions are the most vital, and thus to which during their deeper study the reader should pay particular attention. For example, during the descriptions of all my technical inventions, the most vital aspect is whatever explains item #B2 below, namely that all these inventions have already been build by someone, and thus that it is absolutely certain that their design and operation are correct and can be completed technically also by people. Except that those ones, who already have built my inventions, for various reasons, either do NOT want, nor are unable, to share with us the know-how stemming from the completion of these inventions, nor share with us the knowledge, how to most effectively build these inventions. Thus in order to be able to recognize amongst the massive number of phenomena which surrounds us, that these my inventions were actually build already by someone and that they were previously used, or even that they are used until today, I firstly had to re-invent them, and only after their re-inventing I could theoretically learn their design, operation, and phenomena that their work induce, and thus which allow us to recognize them. All these most vital aspects of my discoveries, inventions, and new ideas, I am to explain in more detail in separate items #B2 and #B3 from this web page. But here I am limiting myself to providing only links to web pages and descriptions of all the "ideas" illustrated in the film "Dr Jan Pajak portfolio". 2. My Periodic Table (1972). My Periodic Table (which sometimes I call also the "Cyclic Table" - because it illustrates the cyclical repetitiveness in developments) is a table very similar to the "Periodic Table of the Elements", only that instead of chemical elements my Periodic Table reveals the regularities existing in inventions and in developments of various propulsion systems. These regularities stemming from that table indicate, among others, that around the year 2036 the mankind will be able to build the starship of my invention called the Magnocraft. The more detailed descriptions of my Periodic Table are provided on the web page named propulsion.htm, and (more precisely) in chapter B from volume 2 of my monograph [1/5]. Notice also that in 2015 I developed a different "Periodic Table for Historic Epochs" (I also call it the "Cyclic Table for Historical Epochs"), which reveals that even in managing the human history, God also uses rules of repetitive cycles. This different table, that is also shown near end of the film "Dr Jan Pajak portfolio", is discussed in sub-item 26 of this item #B1, while it is shown as "Table #K1" on my web page named tapanui.htm, as well as "Table #A1" on my web page named humanity.htm. 3. The Magnocraft (1980). The Magnocraft is an invincible starship of my invention, that uses magnetic propulsion system, and thus that is able to fly with near-light speeds. To its description is devoted a lot of my web pages, the most important out of which is named the magnocraft.htm. However, the most complete description of the Magnocraft is provided in chapter G from volume 3 of my monograph [1/5]. There are two old Polish prophecies, my interpretation of which seems to imply that soon powerful and deadly tribulations are to arrive to our planet, from which the country of Korea is to emerge as the next leader and superpower of the world. This in turn seem suggest, that such a transformation of a small Korea into the next leader and superpower of the entire world would require that Korea develops something that is invincible and thus that would give to Korea a significant advantage over the rest of world, for example something like my starship Magnocraft, that cannot be shot down by any weapon in existence at present, and that would fly with speeds close to the speed of light. Two old Polish prophecies from which this my interpretation of the future is derived, as well as the reason why in my opinion Korea will probably be the country, which as the first in the world is to build my Magnocraft and with the help of this invincible starship is to become the next superpower and leader of mankind, are described in items #H1.1, #H1, and #H3 from my web page named prophecies.htm. 4. The formal proof that "UFOs are already operational Magnocraft" (1981). This proof confirms to us that the construction and operation of the Magnocraft are invented correctly, because they have already been realized by someone, and it also allows us to make it easier for us to build our Magnocrafts by copying the most difficult parts of their designs from solutions sighted in UFOs. The best (brief) presentation of this proof is presented on my web page ufo_proof.htm. In turn the full version of this proof is presented in subsections P2 to P2.15 from volume 14 of my newest monograph [1/5]. An additional evidence, which supports the validity of this formal proof, is also provided in a number of my other web pages, e.g. in evidence.htm, explain.htm, tornado.htm, katrina.htm, cloud_ufo.htm, day26.htm, shuttle.htm, or wtc.htm. 5. The Oscillatory Chamber (1984). This is kind of a "electromagnet" that generates ineffably powerful magnetic field. Because the magnetic field binds huge amounts of energy, it is simultaneously a kind of battery capable of storing the unlimited amounts of energy. Therefore, in Magnocrafts these Oscillatory Chambers will be performing functions that in present propulsion systems are performed by both, the propulsors and by the fuel tanks. The shortest, although relatively accurate description of the Oscillatory Chamber contains my web page named oscillatory_chamber.htm. In turn a complete description of this chamber presents chapter F from volume 2 of my newest monograph [1/5]. The unfulfilled promise of Senator McCain, on the funding of the prize in the amount of 300 million US dollars to the inventor of the device with the features of my Oscillatory Chambers, is described, amongst others, in item #D2 from my web page named eco_cars.htm. 6. The Concept of Dipolar Gravity (1985). My ground-breaking theory of everything called the Concept of Dipolar Gravity is briefly described on the web page named dipolar_gravity.htm. In turn the full description of it contain two volumes 4 and 5 of my monograph [1/5]. It is based on a shocking discovery that I made as the first scientist in the world, and which states that the gravitational field is a dipolar field, and NOT the monopolar field for which it is erroneously assumed to be by the old official science. Later the truth of this my discovery (i.e. that gravity is a dipolar field) I proved formally with several different scientific methodologies - all of which formal proofs I published in subsections H1.1 to H1.2 from volume 4 my monograph [1/5]. The most important amongst these proofs, completed with the use of the method of mathematical logic, is also described in item #D3 from my web page named dipolar_gravity.htm. 7. Explanation for the mechanisms of "telekinesis" and "telepathy" (1985). It is a kind of "by-product" of the development of my Concept of Dipolar Gravity. In the best way these two mechanisms are explained on web pages dedicated to them, namely on pages telepathy.htm, and telekinesis.htm. 8. The invention of "Telekinetic Vehicles" (1985). The Telekinetic Vehicles are to use for propulsion purposes the phenomenon of telekinesis described on my web page telekinesis.htm. But because this technological phenomenon can be released by slightly enhanced version of my "Oscillatory Chamber" used to drive my Magnocrafts, hence these Telekinetic Vehicles will simply be my "Magnocrafts of the Second Generation". Their detailed description is provided, among others, in item #F1.2 from my web page named propulsion.htm, and also in a whole chapter LC from volume 10 of my monograph [1/5]. 9. The philosophy of Totalizm (1985). Totalizm is probably the most important by-product of my groundbreaking theory of everything called the Concept of Dipolar Gravity. Briefly Totalizm is summarized in the web page dedicated to it and named totalizm.htm, while partly also on the web page named parasitism.htm. The full descriptions of Totalizm are provided in volumes 6 and 7 of my monograph [1/5]. In turn the "moral field" on work of which is based the existence of the philosophy of totalizm and which provides it with the most important so-called "indicators of the moral correctness", is described in a number of my web pages, e.g. in item #C4.2 from the web page morals.htm, or in item #H2 from the web page totalizm.htm. 10. My Time Vehicles (time machines), means Magnocrafts of the Third Generation (1985). The work of Time Vehicles of my invention is briefly described on web pages immortality.htm and timevehicle.htm. To their full description is devoted the entire volume 11 of my monograph [1/5]. In turn features and the work of the "reversible software time" of a jumping (discrete) nature, which was artificially programmed by God, and in which people are ageing, as well as the work of the divine "Omniplan" (i.e. the mechanism with the use of which God governs over that "reversible software time"), and also features of the elapsing in a continuous manner "irreversible absolute time of the universe" which elapses around 365,000 times faster than our human time, and in which lives only God, independently from these items #C3, #C4 and #C4.1 of the above web page immortality.htm, are also described in the introduction and in item #G4 from the web page named dipolar_gravity.htm. 11. The model of brain as an input-output device (1987). This model is described in subsections I5.4 to I5.4.2 from volume 5 of my monograph [1/5]. 12. The finding and research of the "Tapanui Crater" (1987). The Tapanui Crater briefly describes my entire web page named tapanui.htm. To its exact descriptions is devoted a separate monograph [5/3] available at the Internet address text_5e.htm (this monograph has also the German and the Polish versions). 13. The invention of the "Telekinetic Cell" (1989). It is described on several web pages, e,g. on fe_cell.htm, as well as in subsections LA2.4 to LA2.4.3 from volume 10 of my newest monograph [1/5]. 14. The explaining of principles of operation of the Swiss "Thesta Distatica" (1991). These principles briefly explain the web pages free_energy.htm, and telekinetics.htm, while in detail discuss them subsections LA2.3 to LA2.3.3 from volume 10 of my monograph [1/5]. 15. Learning about and describing the "Davey's sonic boiler" (1992). To the description of this boiler is devoted my entire web page named boiler.htm. It is also discussed in subsection LA3.3 from volume 10 of my newest monograph [1/5]. 16. The research of the destruction of ancient city of Salamis in Cyprus and related to it my discovery of the particularly harmful for people "telepathic noise" as well as my forecasting of the not-too-distant arrival on Earth of the "neo-medieval" epoch (1993). All these findings describes the best item #54 from subsection W4 in volume 18 of my monograph [1/5], and also in item #K1 from my web page named tapanui.htm. In the local newspaper from the capital of Northern Cyprus I also published a long (two-part long) article (in Turkish) which, among others, discusses these discoveries. This article bore the following editorial data: "Salamis'in yekeme Yeni Zelanda'dan me?" (Ie. "Salamis: could the destruction come from New Zealand"), Kibris daily magazine (Dr. Fazel Küçük Bulvare, Yeni Sanayi Bölgesi, Veteriner Dairesi Yane, Lefkoşa, North Cyprus, Mersin 10, Turkey), No 1404 on 29/06/1993, page 18; and No 1405 on 30/06/1993, page 18. 17. The empirical discovery of the existence of "telepathic waves" and the principles of "telepathic communication" - including the construction and principles of operation of the "telepathysers" (1994). The empirical discovery of "telepathic waves" best describes #60 from subsection W4 in volume 18 of my monograph [1/5]. On the other hand, the history of telepathysers is briefly described in item #E1.1 from my web page telepathy.htm. One among telepathysers, that was donated to our civilization by a mysterious creature and called the "Telepathic Pyramid", is described in treatise  (this treatise has also the Polish and the Italian versions), and in treatise treatise [7/2] (which has also the Polish version). 18. The discovery of "moral energy" - i.e. another among the so-called "indicators of the moral correctness" (1996). The best description of "moral energy" is provided in item #C4.3 from my web page named morals.htm and in subsection JB3.2 from volume 7 of my monograph [1/5]. These descriptions are further extended in other totaliztic web pages, e.g. on my web pages named totalizm.htm and parasitism.htm. 19. The experiencing personally, and explaining, the phenomenon of "totaliztic nirvana" (1997). My personal experiencing of "totaliztic nirvana" is described on the web page named nirvana.htm, and also in subsections JE1 to JE9, as well as JG8 and JG10, from volume 8 of my monograph [1/5]. 20. The invention of "Telepathic Telescopes and Projectors" (1998). To the descriptions of construction and principles of operation of "Telepathic Telescopes and Projectors" are devoted subsections K5 to K6 from volume 9 of my monograph [1/5], and also the entire treatise [7b] (available only in Polish). 21. The discovery of the principle of work of feelings and motivations (2001). It is best described in subsection I5.5 from volume 5 of my monograph [1/5]. 22. The telepathic explanation for work of the "Zhang Heng Seismograph" (2003). It is the most widely described on the entirely devoted to it my web page named seismograph.htm. and in subsection K6.1 from volume 9 of my monograph [1/5]. Furthermore, it is also presented in several papers at scientific conferences (the text of some of these papers is available on the Internet), for example in the paper authored by myself and entitled Signal processing in the "Zhang Heng Seismograph" for remote sensing of impending earthquakes, The International Conference on Sensing Technology (ICST 2005), Massey University, Palmerston North, New Zealand, 21 to 23 November 2005, published on pages 669 to 673 in the Proceedings of this conference (ISBN 0-473-10504-7) - the full text of which was still offered on the Internet on June 2016 at the address www-ist.massey.ac.nz/conferences/icst05/proceedings/ICST2005-Papers/ICST_112.pdf, or in the paper authored jointly by Jan Pajak and Kihyun Chung and entitled Design of an experiment for principles verification in remote sensing of impending earthquakes with hydraulic version of the "Zhang Heng Seismograph", 5th International Conference on Information Technology, sponsored by Institute of Information Technology Assessment, organised by Ajou University, Suwon, Korea, November 16, 2007. Published in the conference Proceedings, pages 55-61. 23. The formal scientific proof that "God does exist" (2007). This proof is formulated for (and with the use) of several different scientific methodologies of proving. Its description for the methods of mathematical logic is provided in item #G2 from my web page named god_proof.htm, and in item #B3 of my web page god.htm. Another method that scientific proving that God does exist, is also presented in item #B3 of the web page named changelings.htm, while with several different methods, in subsections I3.3 to I3.3.4 from volume 5 of my newest monograph [1/5]. Notice here, that this formal proof that "God does exist" is only one among a whole series of similar proofs that have a direct link with it, for example, with the proof that "there is an intelligent counter-world". All those associated formal proofs are listed, and linked, in item #G3 from the web page god_proof.htm. 24. The invention and the description of the "Telepathic Phone" (2013). The most complete description of this telephone is provided in items #D1 and #D2 from my web page named artefact.htm. 25. Standing as an "Independent" candidate in the NZ parliamentary elections of 2014 (2014). The widest description of this my standing is provided in the web page which reports that my candidacy, named pajak_for_mp_2014.htm. 26. The Periodic Table for Historical Epoch (2015). This table is shown, make available to downloading by readers, and discussed thoroughly, on "Table #K1" from the web page named tapanui.htm, as well as on "Table #A1" from my web page named humanity.htm. 27. The explanation of reasons, and the forecast, of the collapse of present human civilization (2015). In the best way this explanation is discussed in item #K1 from my web page named tapanui.htm. A significant amount of information about it is also provided in items #T1 to #T8 from my web page named solar.htm. 28. My correction of official scientific statements that LIGO has received a "telepathic signal", NOT the "gravitational waves" (2016). This my correction results from the finding that LIGO is actually a large-scale copy of the construction and operation of the "telepathic pyramid" already described in section 17 above. My rectification of this significant error that the official science has made, is widely explained in item #E1.1 from the web page named telepathy.htm, while extended on the web pages indicated in that item #E1.1. 29. The question "why?" The answer to this question the reader should probably find himself, e.g. by looking in the mirror and asking himself "how much I myself helped to bring about the realization of any of these ideas?" Whether I, for example, managed to do as little as the recommendation of the film "Dr Jan Pajak portfolio" to a few people among my family and friends? Or rather I intend to continue the current passivity that directly affects the vicissitudes of my life via matters discussed at the web page pajak_for_mp_2017.htm? After all, if everyone is to leave to other people doing whatever is morally correct and is good for the humanity, then NO ONE will be left who would carry out this doing. At the same time certainly will increase the number of people who, in their ignorance of work of moral mechanisms will try to satisfy their own greed by deepening the corruption and moral decay - which the increase, in the final count must end tragically for all people, including you (the reader), and also your loved ones. 30. Funny pictures. In past I had more of them - unfortunately I lost most of them during my constant travels around the world "in search of bread". Because neither the leaflet, nor the film promoted by it, provide literature references which would describe in detail the ideas presented in the film discussed here, links to the Polish-language descriptions of these ideas the reader is to find in "part #B" of the Polish web page devoted to the description of this film, which (web page) is named portfolio_pl.htm (i.e. the web page which is the Polish version of this web page) - especially in items #B1 and #B2 of it. Another problem of humanity which I have solved, and which was illustrated on the described here film, are futuristic technical devices that will eliminate today's destructive behaviours of mankind, because their principles of operation, design, and use do NOT break any moral criteria (in a way as moral criteria are brutally broken e.g. by nuclear power and by the rocket propulsion systems - for details see 3 in item #D4 of this web page), and thus they have a potential to protect a large part of the mankind from a mass extinction - if only some country has enough time to build them before the destruction arrives. Examples of most important among these devices are: the Magnocraft described on my web page named magnocraft.htm, the Oscillatory Chamber described on my web page named oscillatory_chamber.htm, the Telekinetic Magnocraft described in item #F1.2 from my web page named propulsion.htm, the Time Vehicle ("time machine) explained on my web page named immortality.htm, the Telekinetic Battery described, among others, in subsections LA2.4 to LA2.4.3 from volume 10 of my newest monograph [1/5], and on my web page named fe_cell.htm, the Thesta Distatica described, among others, on my web page named free_energy.htm, the Davey's Boiler described on my web page named boiler.htm, the Telepathic Pyramid described on my web page telepathy.htm, Telepathic Telescopes and Projectors described, amongst others in subsections K5.1 and K5.2 from volume 9 of my newest monograph [1/5], the Zhang Heng Seismograph described on my web page seismograph.htm. and the Telepathic Phone described in items #D1 and #D2 from my web page named artefact.htm. An interesting fact which should be stressed here is that in spite of deceptive claims of a variety of liars, all of the above my devices are, or were, already built and used (or working) - except that for various reasons their owners are not willing (or able) to exhibit in the centre of Warsaw or London their demonstration models, while through the loudspeakers announce to all politicians, policy makers, scientists and sceptics, that YES, their principles of operation and general design correspond exactly with what Dr Jan Pająk developed and described, hence the humanity (or specific nations) should start as urgently as possible the constructing of them to have the time to save the humanity from a self-destruction. After all, such a lack of exhibiting somewhere of already built version of my devices and the lack of these loudspeakers' announcements, causes that the immorality, selfishness, greed, jealousy, ignorance, pettiness, etc., of many among today's scientists, politicians and decision-makers, urges them to proclaim around the world these deceitful allegations that supposedly so-far no-one has built my devices and that supposedly these devices are not feasible and impossible to materialize. However, in reality, about absolutely all future devices that I invented myself, or that the principles of which I worked out, it turned out some time after my inventing and describing them in my publications, that someone previously already built them, and thus that their working version already exist, or existed, on Earth. After all, in order to recognize the existence and use, e.g. by someone alien to us that avoids showing us what he have, of some technical device previously unknown to people, one must firstly invent this device oneself so that he gets to know its operation and features. In other words, it is a notorious lie that none of my futuristic devices has yet been built. The truth about this actually says: each of the futuristic devices which I invented, or which the principle of operation and general design I developed, has already been build by someone and its working prototype does exist, or existed, on Earth - only that the knowledge about it has NOT been popularized among the people and NOT entered permanently to accomplishments of the whole humanity, and thus each of these devices I had to invent from the scratch, while the building of each of them will need to be re-performed from the very beginning. (3) My "Magnocrafts" almost every day are seen by someone somewhere in the world, only that they are then called "UFOs". After all, already in 1981 I developed a formal scientific proof (which no-one could refute, though many have tried), that "UFOs are already operational Magnocrafts" - for descriptions of this proof, see sub-item 4 from item #B1, or see my web page named ufo_proof.htm. (5) "Oscillating Chambers" which I invented, NOT only that have already been seen on the UFO decks and reported by many UFO abductees, but were also photographed and left on earth many permanent burn marks. For examples of these see "Fig. #H1" from the web page oscillatory_chamber.htm, or see "Fig. #C9abcd" from the web page explain.htm. (8) My "Telekinetic Vehicles" (means the "Magnocrafts of the Second Generation"), similarly as my magnetic "Magnocraft of the First Generation", are already seen by people in the form of UFOs that operate on the principles of telekinesis. These UFOs can be identified by the use of hexagonal Oscillatory Chambers, by the white "extraction glow" that surrounds them, by the ability to disappear from the human field of view due to the so-called "telekinetic flickering" (see "Fig. #I2" from the web page telekinesis.htm), and by their ability to penetrate through walls and through solid objects. There are also numerous reports of people abducted on such telekinetic UFOs. (10) My "Magnocrafts of the Third Generation", means my "Time Vehicles" ("time machines"), are also often sighted on Earth, while people are abducted into them. For examples see item #G1 from my web page immortality.htm, or item #F2 from my web page explain.htm, or see the report of Miss Nosbocaj from the abduction to just such a "Time-Vehicle UFO" provided in subsection UB1 from volume 16 of my newest monograph [1/5]. (13) The "Telekinetic Battery" of my invention turned out to be built-in each of the three free energy machines owned by the Swiss religious group named "Methernitha". I mean, this battery is already built-in both, the two-disc "Thesta Distatica", as well as in both single-disc machines "Testatica". Actually, all these three machines in the sense of principles of their operation are actually electrostatic motors, the only task of which motors is to generate a series of electrical impulses which initiate the work of embedded into them "telekinetic cell" - which I just invented. That working Thesta Distatica, along with two similar to it machines named "Testatica", probably still are owned by the Swiss religious group called Methernitha (after 1991 I have NOT visited again this group, so I do not know what happens to the machines which are in the possession of it). Also the old "crystal radios" had embedded into them a version of my "Telekinetic Battery" which supplied them into the energy required to their work - for details see item #G1, #C1 i #E1.4 on my web page named fe_cell.htm. A version of my "Telekinetic Battery" is also one amongst components of the "Telepathic Pyramid" - the history of which I described in item #E1.1 from my web page named telepathy.htm. (15) The "Davey's Boiler" also was built by Davey himself. I saw it in his house, and even photographed it at work (although Mr Davey did NOT permit me to carry out the measurements of the energy efficiency of his boiler). It was also tested and checked in work by a number of New Zealand scientists. Several DIY enthusiasts were reporting to me also, that they managed to recreate the construction and operation of this boiler - the only thing I am NOT sure is whether in this re-creation they managed to properly "fine-tune" it (apparently, it is able to work even without fine-tuning - but non-tuned boiler demonstrates a higher losses of energy). (20) The "Telepathic Telescopes and Projectors" must already exist and work, because only with their assistance Daniela Giordano could remotely receive descriptions of how to build the Telepathic Pyramid. In other words, the mysterious giver, who explained to Daniela Giordano how to build the Telepathic Pyramid, have to use for this purpose a Telepathic Projector. (22) The "Zhang Heng Seismograph" was built and operated some 2,000 years ago. The proofs for that are Chinese historical chronicles. In turn the only reason why today's scientists fail all attempts to reconstruct it, is that these scientists do NOT want to accept my explanation that this "seismograph" works on the principle of telepathy - as I explained it to them in a number of my publications, e.g. in the paper www-ist.massey.ac.nz/conferences/icst05/proceedings/ICST2005-Papers/ICST_112.pdf. Let us summarize still with other words the above list of examples of already built and certainly working devices, which principles of operation and general design I invented, or worked out, as the first scientist on Earth, but the existence and work of which are falsely denied by many present scientists and policy makers. Namely, the actual existence of already built and working examples of these devices is the further evidence for the profound truth of words stated in the Bible (see the Gospel of St. Mark, verse 6:3-6) - I quote: So they began to stumble at him. But Jesus went on to say to them: "A prophet is not unhonored except in his home territory and among his relatives and in his own house." So he was able to do no powerful work there except to lay his hands upon a few sickly ones and cure them. Indeed, he wondered at their lack of faith." Because neither the leaflet, nor the film promoted by it, provide literature references which would describe in detail the ideas presented in the film discussed here, links to the German-language descriptions of these ideas the reader is to find in "part #B" of the German web page devoted to the description of this film, which (web page) is named portfolio_de.htm (i.e. the web page which is the German version of this web page) - especially in items #B1 and #B2 of it. Let us consider for a moment, how the reader would judge a scientific article published in a journal of the world fame, in which a group of highly successful scientists financed e.g. by banana producers, summarized results of their research on time-lengths of walks in the open air by people with a variety of personal features. To perform the research the fairest as they can, these scientists would have taken into account people's features resulting from the Darwinian Theory of Evolution. And so, they would study the influence on the time-length of walks of such alternative personal features as having a bald head or full head hair, the use of artificial teeth or their own jaws, the having or not having a rheumatism, and of course, the fact of eating, or not eating, every day at least one banana - after all, their research would be financed by producers of bananas. To also conduct research in line with the current trend of social and political correctness accepted by the today's world, that all humans are supposedly equal and therefore none people are allowed to be discriminated, these scientists do not distinguish between the races of people nor between different sexes or kinds of transvestites - declaring that these differences are irrelevant to results of their research. As a result of costly and deep research on a sample of several thousand of walkers, they would arrive to the final conclusion, which thoroughly and scientifically they would describe in their article, namely that the longest duration of walks in the open air show people who are bald, with artificial teeth, with rheumatism, and who eat the daily minimum of one banana (probably enriching their level of potassium). The question that is worth to ask here of ourselves, is whether on the basis of such an article the reader should try to quickly acquire these features, which the article proves to be inducing very healthy lifestyle, namely the bald head, false teeth, rheumatism, and the habit of eating every day at least one banana, because these features will help him/her to spend the most time while walking in the open air - which walks are highly healthy and therefore very desirable? Of course, everyone who knows the truth about life, would immediately shout "nonsense" and "pure absurdity"! The reason is that these scientists have NOT taken into account in their research the "weather", while all the conclusions to which they arrived are actually products of the weather. After all, the fact that people who are bald, with artificial teeth, rheumatism, and who eat a daily portion of at least one banana, spend so much time while walking, is because they are old retirees on pensions, so they can always choose the time of their walk when there is NOT raining. Meanwhile, the rest of the people are young, most of the day they must work to earn a living, and when at last they could go for a walk, typically is just starting to rain! Although the example of research discussed at the beginning of this item was just invented, it perfectly reflects the today's situation with scientific research. In research carried out at present, professional scientists seem to routinely ignore what actually is most important for the results, namely the "level of morality" in the people affected by work of whatever is the topic of given research, and also the reaction of God on this level of morality. On the other hand, in our world, for which it already has been formally proven that God does exist, absolutely everything must be dependent on the level of human morality and on the response of God to this level - means on the level of human obedience in fulfilling the requirements and precepts of God and on the principles of the God's response to such a level of obedience. (For the totaliztic definition, stating that "morality is the level at which humans obey God's commandments and requirements", see item #B5 from my web page named morals.htm, in turn for the most important among formal scientific proofs that God exists - see item #G2 on my web page named god_proof.htm.) Therefore, without taking into account the morality and methods of God's acting as the factors that determine the fate of humans, virtually everything that scientists of today are researching leads to conclusions as absurd as in the above my invented example of researching walkers! The absurdity of such conclusions of the official science is proven best by my findings published on totaliztic web pages, which reveal the existence of a strong and actual interdependence, between the fate of individual people and also the entire so-called "group intellects", and the level of morality that characterizes their lives. For example, in item #G1 of my web page named will.htm I described my discovery which once shocked me immensely, but which then opened the door to next very important discoveries, namely that people who already in their youth learned to not listen to the voice of their conscience, and hence who from an early age entered the path of immorality, are dying at a relatively young age. A similar fate meets also group intellects. For example, in item #D3 of this web page is described what happened to the state company "P. P. Drainage" which harmed farmers from the village of Wszewilki. In turn in items #I3 and #I3.1 from my web page named petone.htm are described results of my research on disasters and calamities that plagued neighbouring human settlements, but always spared the New Zealand town of Petone, near which lived these required by the Bible at least 10 people with especially moral behaviour, which the Bible calls "righteous". On the other hand, in items #H2 to #H6 from the web page named tapanui.htm I described the destruction of a number of cities that were famous in their times because of the highly immoral conduct of their residents - means such cities as Vineta on the Baltic Sea, Salamis in Cyprus, Saeftinghe in the Netherlands, Port Royal in Jamaica, and Kororareka in New Zealand. Of course, my web pages contain much more similar examples - for further of them see the index provided on the web page named skorowidz_links.htm. The point that I am trying to make here for the reader, is that if in research of fates of individual people and the so-called "group intellects" is completely omitted the taking into account their "morality" and the response of God to a given level of human morality, then the conclusions that are derived from such research represent a complete nonsense. This in turn leads to findings that I described at a whole range of totaliztic web pages, namely that NOT only some of the statements of the official science (such as statements about the discovery of "gravitational waves" or "Higgs boson" - which I described in item #E1.1 from my web page named telepathy.htm), but practically everything about which speaks officially the monopolistic science (i.e. that science which still jealously guards its monopoly on research and on education) is a notorious lie and a deceiving people "hoax on wheels", and thus entrusting such lies and deception of science already led our world to immorality, chaos, misery, exploitation and injustice which we see now around us, while if the humanity do NOT repent on time and do NOT cease doing of whatever the official science directs it to, then this is to lead the humanity to the self-destruction. On totaliztic web pages I described numerous examples to what misery and destruction leads distortions and lies disseminated by the present official science - for examples see items #T1 to #T8 from my web page named solar.htm, items #M1 to #M2 from the web page named telekinetics.htm, items #A1 to #A5 and #F5 from my web page named cooking.htm, the entire web page named tornado.htm, the entire web page named katrina.htm, the entire web page named wtc.htm, and several yet further totaliztic web pages. In turn how numerous are these distortions and lies, and how deeply they are nested already in the very foundations of the old official science, also explains the whole range of totaliztic web pages and publications - for examples see subsection H1.3 from volume 4 of my newest monograph [1/5], or item #C4.7 from the web page named morals.htm, or item #D4 from the web page named dipolar_gravity.htm, or item #K1 from the web page named tapanui.htm, or the entire web page named god_exists.htm. Frankly speaking, it was only when I realized all the consequences of this deliberate avoidance by the official science of taking (in practically all the research) into account the impact of human morality (and also the response of God to the human immorality), that I started to understood what was actually God having in mind when in the Bible He explained what I more specifically developed in item #C4.7 from the web page named morals.htm, namely (see the Bible, Matthew, verses 7:17-18), quote: "every good tree bears good fruit, but a bad tree bears bad fruit. A good tree can not bear bad fruit, nor can a bad tree bear a good fruit." After all, one of the purposes of this explanation is to warn people, amongst others, what is to happens in situations like with today's science, for example, what happens if the humanity entrusts the findings of the present official science and continually implements in real life whatever these findings suggest. The reason for which the official science got lost and already since a long time leads the humanity directly toward a self-destruction, is that we allowed science to become a monopolistic institution. In turn each monopolistic institution quickly falls deeper and deeper into "corruption" described in more detail, among others, in item #E3 from my web page named pajak_for_mp_2017.htm. On the other hand with the elapse of time the corruption of monopolistic institutions quickly reaches 100% level of advancement, at which given institutions in practice are starting to serve the goal which is an exact opposite of the goal for the fulfilment of which these institutions were originally established. In fact, right now increasingly more institutions in the world are reaching the level, and the situation, of such 100% corruption - in this number many governments of entire countries. (It is extremely hard to find nowadays a government that would not operate as a monopolistic institution.) It is also almost an irony, that the humanity long ago had developed an effective method for balancing monopolies, which method prevents the achievement by monopolies of this highly destructive 100% level of corruption. This method is known as the "competition". Unfortunately, in recent times, this method is applied increasingly less in the public life. For example, in order to repair present errors, distortions and lies of the official science, it would be enough to officially create for it a competition in form of the new "totaliztic science" - as this is explained more comprehensively in item #C6 from my web page named telekinetics.htm. However, the old, official, atheistic science, is to defend itself as it can against the loss of its monopoly, that is, against the official establishing of the new "totaliztic science". 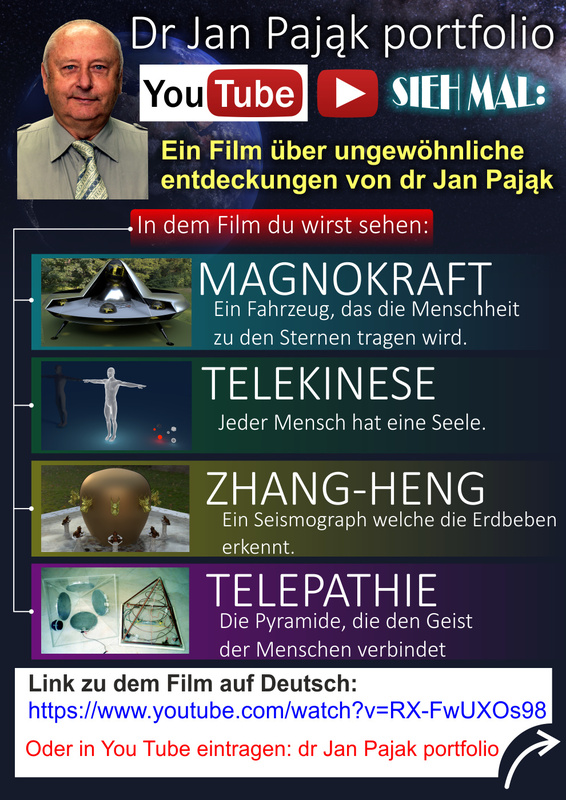 After all, my theory of everything called the Concept of Dipolar Gravity and the philosophy of totalizm were created in 1985 (means as long ago as 31 years prior to producing in 2016 the discussed here film "Dr Jan Pajak portfolio") and they are continuously published and disseminated throughout all that long time. In spite of this, still even now the official science insists that neither my "theory of everything" nor the philosophy of totalizm is officially recognized, and the spread of them is blocked - although in contrast to the "erroneous" theories and philosophies disseminated by the old official science, for my Concept of Dipolar Gravity and for totalizm their accuracy and compliance with reality have already been proven. That insistence of the official science causes untold destruction and losses for our whole civilization - to what I am trying to draw the reader's attention in descriptions from this item. On the other hand, the official establishing of such a new competitive "totaliztic science" would force the old official science to start the responsible telling of truth and to put more attention and actual research into whatever now this old science does profitably, irresponsibly and in an almost mindless manner. After all, if there is a competitive towards the old, new "totaliztic science", then in every case of spreading lies by the old science, the new science would make these lies corrected (as indeed, in spite that I work alone, still I am trying to do already). Therefore, such an official establishing of a new competitive "totaliztic science" must be imposed forcefully by people and by governments, and NOT left to luminaries of science and scientific policy makers to make this establishing by themselves voluntarily. However, it is worth the effort, because it can save the humanity from impending doom that is arriving now rather quickly - that is, dear reader, it perhaps may, among other things, save your own life and lives of those whom you love the most. Unfortunately, knowing the today's biggest weakness of humanity, which is the "passivity" and "complacency" described in item #N2 from my web page named pajak_re_2017.htm, we should know in advance what will happen with the official creation of the new "totaliztic science". Namely, people will ruminate over it, and perhaps even debate it, but they will NOT act - as they are currently also doing regarding the "global warming". They will be reeling over it until about 2040, when arrives the destruction of humanity predicted in the discussed here film from www.youtube.com, entitled "Dr Jan Pajak portfolio". In turn, after that destruction, everything will be destroyed - including the official science. Thus, these few people who are to survive the calamity, will need to start building again everything from the very scratch. Of course, knowing already that it was the previous official atheistic science that pushed the mankind to destruction, they are to rebuild NOT the old official science, but the new "totaliztic science". However, there will be a problem again. Namely this problem will then lay in the fact, that even the new "totaliztic science", if it existed and operated without any competition, with the elapse of time will also fall a victim of the "corruption" - thus the current problems with the monopoly of science will over time be repeated again. Therefore, most preferably would be, if already now people stopped briefly that passive viewing of television and chumming sandwiches, and rather already now have created a new "totaliztic science" - when the old science still has NOT been destroyed (so that both of these sciences, from now acting in the situation of competition with each other, would stop each other from falling into claws of corruption, and thus would busily tend towards the good of the entire human civilization). After all, the appointment of such a new science is NOT difficult at all. It is just enough that in a country, e.g. in Poland, New Zealand, or Korea, at the beginning would be open at least one state institution of higher education (e.g. a university), which would employ only scientists already practicing the philosophy of totalizm and hence able to pass the "entrance exam" from the knowledge of this philosophy, as well as all universities and schools of the country would begin to balance the current imbalance in the atheistic teachings by starting the compulsory teaching of the philosophy of totalizm and my theory of everything called the Concept of Dipolar Gravity. The film described hare is approximately 35 minutes long. 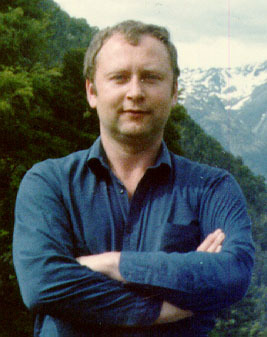 The designer of its scenario, the author of animation, and the producer of it is Dominik Myrcik. The film is entitled "Dr Jan Pajak portfolio". The film "Dr Jan Pajak portfolio" in a very interesting, lively and eloquent manner documents, animates and explains these ones among the most important results of my research and inventiveness, which should be of interest to almost everyone. For example, it discusses, among others, the quickly incoming mass extinction of our civilization, that the most of people alive currently on Earth will soon have the dubious privilege of personal experience on themselves - if in the meantime the humanity will NOT try to implement in real life those NOT violating moral criteria future technical devices which are described in the film discussed here. The reasons for the scenario of this mass extinction of people I described in more detail, among others, in items #H1 to #H3 from my web page named prophecies.htm. Moreover, the fact that this mass extinction is already coming, independently from me is noticing a growing number of people open to the truth. After all, it is enough to carefully look out the window today, to note that we are like passengers in a speeding train, which rushes along the tracks that are ending to an already visible cliff, but the pleadings of which passengers directed to the engine drivers that control the train go onto deaf ears. My personal report on the progress of humanity in approaching towards this mass extinction, the reader can find e.g. in items #T1 to #T8 from my web page named solar.htm, in items #A1 to #A5 of the web page named cooking.htm, as well as in pages that I am pointing above in items #G1, #F2, #E3 and #A1 from my web page named pajak_for_mp_2017.htm. The film "Dr Jan Pająk portfolio" can be viewed on almost every device with a screen connected to the Internet and with access to YouTube (including on PCs). Hence, I would recommend to watch it several times, including pre-watching (first time and fast) on the screen of your home computer. In turn after such preliminary learning of what this film shows, you can better understand and appreciate its detailed descriptions from this web page. Thus, soon after that first viewing, I would recommend to read the film's descriptions from selected items of "part #B" of this web page. In the end, i.e. after learning descriptions in which we are interested, it is worth to see the film again, this time seeing it in more detailed way and with greater understanding. For this repeated, detailed viewing of the film I would recommend to use a large screen of the modern TV - e.g. in own home, or in home of your family or friends. (Of course, if the reader has such a TV readily available, then he/she can watch this film in TV already for the first, initial time.) After all, if the reader wishes to experience and appreciate the artistry of the images and sounds, as well as learn details of its story, and wonderfully designed and constructed its images and animations, then it is best to see it just on a big screen of a modern TV. Such a modern TV is to fully emphasize its qualitative features, such as high definition (HD), high quality (HQ), and excellent colors and sounds. Hence, the best for watching it would be a so-called "smart" TV which, by definition, has a direct connection with the Internet (I watch it on my 42-inch "smart" TV from LG company – i.e. the same one, for which I programmed my "playlists", for example the "playlist" available at www.pajak.org.nz/p_12fb.htm), or would be a TV that is connected to a computer, and that computer is in turn connected to the Internet. The film discussed here is really designed and produced superbly (after all, its production took half a year of work and lasted since November 2015 till May 2016). Thus, although those fierce enemies and critics, many of which my discoveries and scientific achievements still have, probably immediately accuse me here of bias, I believe that it is the best film presenting anyone's scientific achievements which so far has been made and placed on YouTube - if anyone believes otherwise then I challenge him or her to indicate to us any better film of this type. In fact, I consider it to be a huge honour and pleasure for me, that so perfect film shows the most significant "milestones" of my current scientific achievements. I could NOT get a more precious gift on my 70th birthday than this film is! What makes me particularly happy is that this film was designed, animated and produced by a Polish person, or more specifically by an Upper Silesian. In this way, it also proves how talented and perfectionist are those people originating from Poland. So it cannot surprise us the saying, which I described in item #E1.1 from my web page named telepathy.htm, for some time disseminated in England and stating something along the lines "hire a Polish emigrant, and he will complete a given job four times faster and for only about one-fourth of the price of an English professional". What a pity that all this talent, knowledge and capabilities of people born and educated in Poland are now serving for other nations. Hopefully, my efforts described (in Polish), amongst others, on the web page pajak.org.nz/pajak_dla_prezydentury_2020.htm are to redirect to the progress of Poland these all Polish intellectual accomplishments derived from Poland, and thus over time will result in the restoration to Poland of its former moral power, size, prosperity and strength proverbially inspiring other nations from a sea to a sea. Images of the discussed film create a perfect visual foundation for descriptions from almost all the totaliztic web pages, while the emotional charge contained in them moves to depth. Thus, in connection with the explanations and evidence shared on this and on other totaliztic web pages, the film has the potential to provide that breakthrough impulse which changes the course of life of the viewer. From the feedback opinions, which on this film reached me so far, it stems quite clearly that it has just such an effect on the viewer. Practically so-far the entire feedback is positive and enthusiastic. The only matter which people are unaware and thus ask about, is that all my inventions illustrated in the film, actually were already build by someone, and are, or were in past, already working - only that someone who build them either does NOT want, or is unable, to give to us the working model of these inventions. Unfortunately, in order to recognise that they are, or were, already build, I first needed to invent them from the scratch, and only then I could recognise them in objects which we see but NOT understand. Therefore, I decided to develop in item #B of this web page, the detailed description as to "who" and "where" already build my inventions, and also how we can be sure that they are already build and working since we cannot buy them in our shops. In item #C4.2 of my web page named morals.htm I described the work of so-called moral field - means the field similar to gravity, but acting on work of our intellects. This field works in two stages, namely a short-term, and a long-term. If we do something that is morally correct, needed, beneficial, and agreeable with God's requirements, then in the short-term work this moral field places obstacles in front of a person (or a group intellect) who is making a given effort of doing good deed. Only in its long-term action (i.e. only after elapses the so-called "time of return") moral field starts to "reward" the good deeds that someone carried out previously. Therefore, according to recommendations of totalizm whenever we do something that we believe is morally correct and good for all parties involved, then obstacles for sure are to appear and our duty is to attempt to overcome these obstacles, as their existence is the proof that whatever we try to accomplish is fulfilling moral criteria and thus will be beneficial in the long-term work of moral mechanisms. The only situation when we should "give up" in face of obstacles, is when from our judgement stems that the chance of a success is equal to that from the proverbial situation of a "bull versus locomotive" (in the difficult case I am describing here initially it may seem to be just such a chance). I must admit, that two days already elapsed but I still do NOT see clearly how to solve this problem to a satisfactory level in a way which would be acceptable from the point of view of the philosophy of totalizm - means which does NOT break any moral criteria nor any law, and which would make happy all sides involved. But I know that at least one such a perfect solution does exist, only that it is well hidden and thus one needs to put a lot of effort to find it (totalizm calls this special solution the "highway through the sea" - for details see item #A2.4 from my web page philosophy of totalizm, item #C4.2 from my web page morals.htm, or item #J3 from my web page pajak_for_mp_2014.htm). When I find such a way I immediately report it here together with outcomes which it provides. However, on the third day of my memorable conversation with the NZ uniformed customs officer, I received the advice what I could continue to do in this case. This advice gave me someone, whose excellent knowledge and understanding of life and the principles of solving life's problems I greatly admire and greatly respect. Namely, he started from making me aware that firstly I should somehow find out, what should be done to make the shipment NOT dutiable. Since the NZ uniformed customs officer said that my leaflet represents an "enterprise" (i.e. "the company"), she has her opinion be based on some law. Thus it would be good, that I firstly receive the information, or opinion, of a lawyer, that's my activities, at least these private ones, are NOT the subject to duties because they are non-commercial, and I do NOT have any established business, the existence of which requires the documentation of a company such as a business or an enterprise. So I would require a legal opinion, on which basis the NZ Customs may require a payment from the person who does not lead any gainful activity. In order to receive such an opinion, the person who advised me suggested that, as so-far, I cannot yet "appeal" in the matter of leaflets, as such an "appeal" could in fact be only my reaction to another action of the NZ Customs Office. After all, so-far that authority has not yet taken any action - only their uniformed officer informed me about such a possibility, but there was no official letter. For this reason, I should firstly describe my visit to their office (but without details), and inform the office that I was during that visit told to hire an agent and to pay customs duties during receiving a package with PRIVATE leaflets (print) for a person not carrying out business activities nor having documentation of an economic activity, and therefore I would like to seek the written opinion of the authority, i.e. if they could show me a legal basis to require the payment of such a fee from a private individual, or if they could send me an internet link to the text of the law that then I could have read it, because I would like to be sure, that the collecting such a fee has a legal basis. Of course, this letter would have to be written in the conditional toner, politely, as a query, writing something like "inquiry regarding the legal basis for requesting the payment of duty from private individuals". After receiving the above advice, I began to "attempt" its implementation. This trying took me a few days, because I have to admit here that I am NOT "strong" in writing the official polite letters (in this case email) in English. During this trying, I recalled that as a student of one of the last years of my studies at the Technical University of Wroclaw, Poland, I practically went already through a very similar situation and experience. This is because I got then into an exchange of similar official correspondence with a kind of state-owned enterprise (P. P.) existing then in Milicz, whose exact name I do not remember now, but because it carried out the "drainage" of agricultural land, among others in the village of Wszewilki, including the small, 3-hectare land belonging to my parents, in my descriptions of that situation and experiences that I am to provide below, that company I will call "P. P. Drainage". That my correspondence with this "P. P. Drainage" is quite educating, because it strongly suggests what most likely would be the final consequences and final "achievements" of any of my getting into a similar exchange of letters with the New Zealand Customs Office. So let us firstly carry out a "case study" of that historical event. Motto: "In collisions of 'a bull with a locomotive', instantly bull always loses, however, after the 'time of return' the moral mechanisms cause that the locomotive lands in a scrap metal yard." This happened in the final years of my studies at the Technical University of Wroclaw. In the village Wszewilki highly active was then the state-owned company, to which the previous item #D2 refers under the name "P. P. Drainage". The company carried out the maintenance, and where it was needed - also re-digging, an ex-German drainage ditch that near the town of Milicz fell into the river Barycz, while by Wszewilki it ran along the foot of raised sandy slope on which extend the buildings of that village. These works it carried out repeatedly, every few years, already for a longer period of time. As a result, the inhabitants of Wszewilki village had a lot of time to compare effects of its work with previous times when the company still did NOT exist, and to notice the ecological consequences of its activities. In those days I did NOT know yet about the sign of "reversed function" described in more detail in (B1) from item #E3 of my web page named pajak_for_mp_2017.htm. Namely I did NOT know yet that if the true functions and goals of the current activities of a given "group intellect" represent a complete reversal of functions and goals for the achievement of which this intellect was originally established, then that is a sign that the intellect has already reached 100% level of corruption, means that its behaviour is governed solely by the greed and cronyism, while as such in its activities it already ceased completely to guide itself by the rule of law, justice , morality, the welfare of others, etc. On the other hand, NOT knowing about this "sign of 100% corruption", and often listening to endless complaints of my parents about 'fruits' of the activities of this company, I wrote to them a letter, in which I explained all these reservations which to it had my parents. I mean, I explained to them the reduction of crop yields due to lowering of the ground water level and due droughts caused by it, I reminded to them that the drainage ditch running by the land of my parents is always carefully dredged and maintained, so that the company did not have to perform any action on it, and I also have referred to a law, which then I found, and which establishing this kind of state-owned companies in Poland stated that their services will be free of charge for farmers. While writing this letter, I did not realize then yet, that human laws can be "stretched" like a rubber, i.e. that the familiar with twisting the laws lawyers can "interpret" them in various convenient ways, and thus ultimately for the person who has access the best-paid lawyers they always allow to achieve the result on which he/she counts. As a result, after sending that first letter, for the next about two years I was forced to laboriously write more and more letters, trying to bring with them from the constantly slipping out company some beneficial for my parents outcome of this legal "ping-pong". In fact, if I could then transform the time and effort devoted to these letters into some paid work, then I would have earned more than the fees required by that company from my parents. So the only thing that in this way I got, was that when this "PP Drainage" officially asked the local "citizen tribunal" to punish all the farmers of the village Wszewilki, who do NOT have paid the outstanding fees payable to this company, it made an exception for my parents and did NOT demanded punishment or delinquent payment. However, the activities of the company was still continued in the previous way, still harming the productivity of agricultural land of my parents, and still exposing the entire village Wszewilki to unwarranted costs and losses. For me, a relatively educational turns out to be the later fate of that company and of its operations, which took place already after the elapse of the "time of return". Namely, when the "Solidarity" toppled communist rule in Poland, in Milicz was created some other company (this time NOT owned by state) that instead of "drainage" of the land of Wszewilki, most of the land turned into fish ponds. But because these ponds already operate on different principles of "hydraulics", NOT "drainage", that, "PP Drainage" was "killed" by it - exactly like the descriptions of signs (B) from item #E3 of my web page pajak_for_mp_2017.htm explain, that after the "time of return" just to such a killing are subjected all group intellects that are corrupt already at 100%. In the case of that corrupt at 100% group intellect "P. P. Drainage", it is even possible to estimate roughly of how much was for it this "time of return" - I roughly estimate this time at approximately 25 years. Thus, if e.g. those my struggles took place today, which is around 2016, the killing of this group intellect would take place around 2040 - i.e. in the years about tragic events of which quite clearly speaks the film "Dr Jan Pajak portfolio". 1. With my "zero-dollar" principle of conduct in life, these leaflets I still would have to personally deliver to homes from the area where I live. However, winter is coming to NZ, means the time the cold rains, winds, lightning flashes and storms. In addition, from my previous experience, which I described in item #N4 from my web page pajak_for_mp_2014.htm, it appears that such distribution of leaflets is often associated with rather unpleasant treatment, dog attacks, with the issuances of exposing oneself to the action of elements, not to mention the long hours of everyday systematic work and contribution of physical fatigue. In turn my personal dedication to the distribution of these leaflets, would cause that I would have to simultaneously neglect other activities which I pursue, e.g. the further development and popularization of the philosophy of totalizm. 2. The unnecessary endangering of the idea of "telekinesis free zone". After all, during a possible helping of local "golden hands" I would have to consider the idea of "telekinesis free zone". This is because in order to avoid future commitment by mankind of a similar error regarding telekinesis, that the humanity already committed regarding pesticides and antibiotics, while currently equally mindlessly scientists take to re-commit regarding the GE (ie. "Genetic Engineering"), as the discoverer of "telekinesis" and inventor and operating telekinetic devices, I suggested in my web page named tfz.htm, that at the area of entire New Zealand, Australia and Antarctica, was established the "telekinesis free zone". In turn the establishment of such a zone practically means, that on this area may NOT be tested, manufactured, or used any devices operating on principles of telekinesis. This in turn also means that even if a "handyman" from New Zealand, for example, wanted to build my "telekinetic cell" and had every opportunity for doing so, I still would be forced to refuse my advice and intellectual support for his/her efforts and activities. 3. The need to avoid inducing a negative tradition around my inventions. In several places of my web pages I explained the fatal consequences of surrounding with a negative (immoral) tradition of a direction of human activities. For example, in the caption under "Fig. #1" from my web page named p_e.htm, in item #C4.7 from my web page named morals.htm, and also in item #K1 from my web page named tapanui.htm, I explained that with such a negative tradition already was surrounded the rocket propulsion system. Hence the moral mechanisms cause that this propulsion system will never be generating "good fruit" that in its long-term action would serve for the actual good of the humanity (for the explanation as to what "good fruit" I mean, see the quotation from the Bible discussed in item #B3 of this web page). In turn last two above web pages, as well as, among others, items #M1 and #M2 on yet another my page named telekinetics.htm, describe are similar immoral traditions with which was surrounded the nuclear energy. This is why nuclear energy, nor any of its "fruits" in its long-term effect will ever serve for the actual good of humanity. After realizing this, I find it hard to make myself to get into into any further debate regarding the leaflets, which would make me risking that through these debates my inventions intended for the benefit of entire mankind could be accidentally surrounded by a similarly negative tradition. 4. A significant probability that the group intellect of country New Zealand has already been punished by the "forced passivity". In item #N2 from my web page named pajak_re_2017.htm I explained that intellects which practice a serial passivity, in the long-term work of moral mechanisms may be punished by the so-called "forced passivity". In turn watching the current situation in NZ, I have an impression, that this punishment has already been imposed onto it. If this was really so, then any attempt to do anything that would try to break this "forced passivity" before the events discussed in the film only for around 2040, including e.g. my attempts to persuade New Zealanders to undertake the construction of one of my inventions, could NOT bring any results. After all, by the consequences of this "forced passivity" they would in advance be doomed to fail. 5. The danger that the fervour of the struggle could also distort for the outside audience the clarity of goals towards accomplishing of which I try to serve. After all, there is a saying that "the first victim of every war is the truth". In addition, many people have a tendency to judge the conduct of others through the prism of their own worldviews. Meanwhile, future fate of the philosophy of totalizm depends mainly on how people will assess my conduct - which fact is clearly visible from the consequences for totalizm of these previous accusations that about me and about totalizm all sorts of evil-doers have placed on the Internet. So I should not be risking that struggling in the name of human progress, I deliver simultaneously ammunition to enemies of totalizm, who probably then would have come out with attacks like "if he so persistently struggles with that customs office, he is probably hoping for some material benefit, e.g. from the sale of these leaflets". After all, from the very beginning the uniformed female oficer of the Customs Office stated that my leaflets bear the characteristics of the "enterprise" - that is (implicitly) that probably the hide in themselves some my intention to 'make a fortune" with their help, after they are duty-free delivered to me, about which delivery I dared to ask. To summarize the above, my more thorough considering of the matter of any further continuation of such "Don Kichote" ("Don Quixote") struggle to obtain permission for a duty-free, "agents-free" and "zero-dollar" letting the parcel of leaflets to NZ, so that then I could distribute these leaflets for free to houses in the vicinity of my place residence, shows that taking these efforts could bring effects that are exactly opposite to these intended by me. So I decided that I abandon the continuation of my efforts in this matter, and also taught by the previous experience, in the future I will avoid all voluntary intentions and actions that would involve me with the necessity of personal having anything to do with the New Zealand Customs Office. As the previous descriptions illustrated this, there is a lot happening in our civilisation right now. For example, technical devices already exist and work, which practically solved all current problems of our civilisation - including the problem of energy (which the telekinetic cells generate for free by spontaneously absorbing heat from our environment), the problem of space exploration (which the starship called the Magnocraft solves by using the magnetic propulsion system that allows it to reach speeds of light), the problem of electromagnetic waves that kill our bees and induce cancers (which the device called the telepathyser solves by using telepathic waves instead of electromagnetic waves), etc., etc. Since 2007 there is also published a formal scientific proof which indicates beyond any doubt that God does exist. Unfortunately, neither the media, decision makers of our official science, nor politicians and governments, wish to acknowledge all this. Thus our civilisation, like a train controlled by blind people, rushes straight towards a cliff and own destruction. The film discussed here illustrates well this highly puzzling situation. On the above my most favourite photograph, I am shown on the background of beautiful New Zealand landscape at the age of 40 - i.e. when I still had almost all hair. However, my most recent appearance shows the passport photo from Figures #A1, #B1 and #B2 of this web page, as well as the video from my interview (in the Polish language) recorded via "Skype", links to which are provided in item #A4 of this web page. In turn photographs that illustrate how my appearance kept changing during 70 years and in a range of different periods of my life to-date, are shown in "Fig. #1" from the web page named pajak_jan_uk.htm. By education I am a Mechanical Engineer with the publicly defended degree of a Doctor of Technical Sciences. However, in my latest profession, which I practiced until 2005, and then repeated for 10 months in 2007, I lectured computer sciences and information technology. I specialised mainly in Software Engineering, Web Technology and in Information Processing (using the Web Technology). But my hobby research, carried out until today in my private time and on my private cost, amongst others, includes development of the new, moral, peaceful, constructive, and uplifting philosophy of totalizm which is based on the operation of moral field, moral laws, moral energy, and karma. For more details about my life, research, and work, it is worth to have a look at web pages about me (i.e. Dr Jan Pajak), or secular and scientific view of God, listed in "Menu 1" or "Menu 2". One can also read subsection A4 from volume 1 of monograph [1/5], free copies of which are available, amongst others, also via this web page. The thorough knowledge of totalizm presented on this web page, is immensely vital for our lives. After all, depending how well we learn this philosophy, this is going to reflect on how moral, and thus also how happy and fulfilled our lives will be. This is the reason why I created the web page that summarises totalizm. However, accomplishing a progress in our knowledge of totalizm places a requirement that I continually advance research on it. Therefore, even at present I carry out various experiments aimed at determining further information about moral laws, karma, etc. Results of this research are to be published as soon as they are available in the final form. Therefore the development of this web page cannot be considered to be completely finished, but must be carried out continually. In future this web page will be periodically updated, improved and extended, as soon as any new information becomes available and I finish verifying it. So I am inviting to visit this web page again at some stage in future, in order to check what new becomes known to us regarding totalizm, moral laws, moral field, karma, etc. It is also worth to check periodically blogs of totalizm some of which operate already since April 2005, means since the time when Internet discussion lists of totalizm experienced a massive sabotage and needed to be replaced with blogs. Blogs of totalizm are available under several address, e.g. : totalizm.wordpress.com, and totalizm.blox.pl/html. (Notice, however, that all these addresses hold mirror copies of the same posts with the same content of messages, and that public discussions on topics presented on these blogs are NOT carried out on them, but on Google discussion groups from item #J6 below.) After all, on blogs of totalizm many matters discussed on this web page are also explained with additional details written as new events unveil before our eyes. Furthermore, these blogs contain links to most recently updated web pages of totalizm. Readers who wish to discuss any topic addressed on this web page, or on any other web pages of totalizm, should be interested to know that these topics are discussed at a whole array of threads from Google discussion groups. Topics and addresses of these threads are listed in item #E2 from the totaliztic web page named faq.htm. I should also add, that from the beginning of my work on totalizm and on other topics linked to totalizm, every new topic which I am researching I try to expose to a public discussion. I count on receiving feedback. But because the official science and the majority of scientists turned their backs to whatever I am researching, for the lack of scientific channels of receiving this feedback I was forced to discuss these topics in Internet. Unfortunately it introduces serious drawbacks. E.g., for strange reasons - which I also try to investigate, these Internet discussions in the majority of cases occur between some individuals which are well masked and clearly feel safe behind the screen of their anonymity. These individuals transformed recently Internet discussions into kinds of verbal matches the participants of which are competing in throwing mud and spitting at every constructive idea. This shocking phenomenon of abusing and spitting instead of communicating and discussing, is lately so widely spread, that it is even discussed in newspapers - e.g. see the article "Excuse me, could we please be a bit more polite", from page B3 of the New Zealand newspaper Weekend Herald, issue dated on Saturday, January 3, 2009. In spite of this escalation of the internet culture of verbal abuse, for the lack of other channels of gaining feedback regarding topics which I investigate, I still try to expose each topic researched to such Internet discussion. After all, between abuses and personal attacks, sometimes appear also single constructive voices in the discussion which contribute a new quality to a given topic. Therefore, still is worth to scan these discussions, seeking in them these rational and constructive comments. Current email addresses to the author of this web page, i.e. officially to Dr Eng. Jan Pająk while courteously to Prof. Dr Eng. Jan Pajak, at which readers can post possible comments, opinions, descriptions, or information which in their opinion I should learn, are provided in item #L3 from other my web page named pajak_jan_uk.htm (for its version in the HTML language), or the web page named pajak_jan_uk.pdf (for the version of the web page "pajak_jan_uk.pdf" in safe PDF format - which safe PDF versions of further web pages by the author can also be downloaded via links from item #B1 of the web page named text_11.htm). Copyrights © 2017 by Dr Jan Pajak. All rights reserved. This web page is a report from outcomes of research of the author - only that is written in a popular language (so that it can be understood by readers with non-scientific orientation). Majority of ideas and presentations providedd on this web page (and also in other publications by the author) are unique for the author’s research, and thus from the same angle these ideas were NOT presented by any other researcher. As such, this web page presents a number of ideas, inventions, theories, illustrations, tables, etc., which are the intellectual property of the author. Therefore, the content of this web page is the subject to the same laws of intellectual ownership as every other scientific publication. Especially the author reserves for himself the moral credit and copyrights for the scientific theories, discoveries and inventions, photographs, illustrations, tables, etc., mentioned or utilised on this web page. Therefore, the author reserves that during repeating any idea presented on this web page (i.e. any theory, principle, explanation, deduction, interpretation, device, evidence, proof, discovery, invention, photograph, illustration, table, etc. ), the repeating person revealed and confirmed who is the original author of this idea (means, as it is used in creative circles, the repeating person provided a full moral "credit" and recognition to the author of this web page), through a clear explanation that a given idea is repeated from the web page authorised by Dr Jan Pajak, through indication of the internet address of this web page under which this idea was originally explained, and through mentioning the date of most recent update of this web page (i.e. the date indicated below). My apologies, because the SQL database on the server that supports counters of visits with the logo of totalizm (such as above) is out of order since 2016/6/15. Therefore on all of my web pages these counters of visits have stopped counting the visitors and it is NOT in my means to rectify this situation. Currently these counters of visits show only the traffic data for my web pages that occurred between 1 January 2016 and 15 June 2016 (unless the server owner managed to fix the SQL database after the date of the last update of this web page).